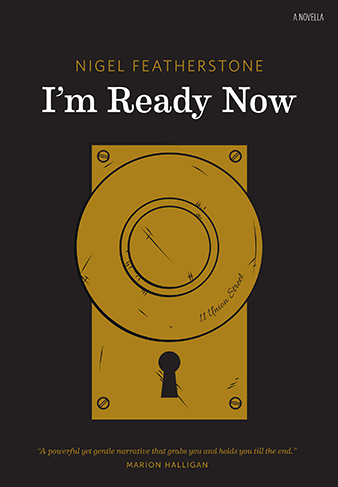 I enjoyed reading your interview with Susan Errington of Wet Ink, Nigel, but of course that was prepared before the publication of your latest book, the novella I’m ready now. What intrigued me about this and your previous novella, Fall on me, is that the main characters in both are somehow stalled by their pasts. What is it about the past that draws you to write about it? Milan Kundera wrote that the novel mustn’t be the writer’s confession, and I agree with his statement, but it does seem as though most writers find themselves exploring the same or similar ground over a series of works, perhaps it’s all they’ll ever write about; whether this is a confession or not I’m uncertain, but perhaps these patterns point to something important in the writer’s psyche. In his illuminating On writing: a memoir of the craft (2000), Stephen King talks about how he has really only one theme – that it’s difficult to put everything back in Pandora’s box once it’s opened. Tim Winton, of course, has his lifelong infatuation with the south-west coast of Western Australia and the men who people the place, especially the men who are trying to work out their masculinity and what role they can play in the family environment. In terms of my own writing, you’re spot-on that both I’m ready now and Fall on me are about people – men and women – who are trying to work through something from their pasts. What are these things we all have that might hold us back or anchor us down? What stops us from becoming the people we want to be? What if we pretend that there’s something in our past that seems fine but really isn’t? In Fall on me, Lou Bard has had to survive the murder of his wife, and he’s done this with considerable focus and tenacity, but it’s meant that he’s never found anyone to share his life with in a romantic way – though by story’s end things are looking much more hopeful. In I’m ready now, mother Lynne finds herself remembering a great but fraught love from her late-teen years, while son Gordon believes that a year of running amok will ameliorate the impact of what happened to him at the very beginning of his life. Novellas/novels are always about time, and the past is an endlessly fascinating element of time. The past is also about the present and the future, so it’s the foundation of all of us. Done well, the exploration of a character’s past can be analogous to a country’s past. If a character’s past is difficult then their country’s past may well be difficult too. Australia’s past is difficult. Perhaps all its fictional characters must be difficult? In the third part of your Wet Ink interview, you say, ‘That’s my mission as a writer: to gently lead people into the darkness and show that there’s not a lot to be scared about’. As a reader, I’m intrigued by writers’ intentions and would love you to tell us what’s behind this mission of yours. This is something that I’ve only recently started to think about, primarily with the publication of my novellas. I try to write in a very accessible way – I want to be read and I also want to be read by a diversity of people. That’s not to say that I’m disinterested in the musicality of prose, or that I’m not fond of the odd literary firework or two. It’s just that I don’t aim to be difficult. However, I do write about things that some readers may feel is difficult, and indeed correspondence I’ve received seems to indicate this. As mentioned, Fall on me is about a man struggling to come to terms with the senseless end of his wife’s life almost two decades ago, and how their son, who’s now a teenager, persists in doing bravely creative – if not ridiculously dangerous – things with his body and life. I’m ready now is dark in other ways: just after her husband’s death of a heart-attack, Lynne Gleeson finds herself thinking about a love affair from her childhood, a love affair that gave her a son; meanwhile that son, now an adult, is papering over the fractured start to his life by conning himself that he’s happy and simply being playful. Whilst I’m not a horror writer, nor do I read horror, in some ways these are horrible – as in ghastly, shocking, almost unspeakable – predicaments for these characters to be in, but my intention is to write about it all in a way that allows everyone inside. Whether or not I’m a true storyteller, I have no idea, but I do adore Okri’s words. Your novella Fall on me is told in third person, while I’m ready now is told in alternating first person voices. How do you decide what person/voice to tell a story in, and can it change during the writing process? These are the choices a writer makes, and sometimes the choices are made at the very beginning of the writing process and they stick, other times there’s a change of mind (or heart) halfway through the writing, even during final editing, and things are altered. However, with both these novellas I was clear from the first few marks of the pen what I wanted to do. I’m ready now would be told in the first-person voice – I wanted the sense of intimacy that this brings – and also that the story would be told through both the mother’s and the son’s point of view, so we see their similarities and differences. Even though Fall on me was published first, it was actually written after I’m ready now, and I made the decision that having just finished writing a first-person narrative I wanted to write a third-person narrative; thankfully this particular story works much better for the distance and perspective that the third-person mode brings; as the writer I was able to be less emotionally entangled. It’s true that there can be changes through the writing/editing process. My novel Remnants was drafted first-person but much later was changed to third-person. I’ve heard that other novelists have done similar last-minute surgeries. However, I do think that the point-of-view schema of a work is so important – so incredibly integral – that if there needs to be such a significant change then it’s quite possible that something at the core of the story’s construction isn’t working. Another comment you made in the third interview struck me. You said: ‘I’m interested in place as character’. Many years ago I was in an online reading group in which this topic caused much angst: some members argued that place can’t be a character, and others argued just as vociferously that it could. I’d love to know what you mean by “place as character” and the role you see it playing in your writing. Oh yes, place can be character! So, houses and farms and towns and cities, even whole countries, can be places that we connect with as though they are living and breathing entities, and this notion is such a great thing for writers to explore. A fiction writer’s job is to make all the elements of a narrative come truly alive for the reader, and we do this through drawing connections and relationships that matter to the people of the work. As mentioned earlier, Tim Winton writes about the closeness but almost unknowable vastness of Western Australia, and Randolph Stow did something similar, particularly in The merry-go-round in the sea. Marion Halligan often writes about her relationship with Canberra, and, of course, Kate Grenville has a long-time fascination with the Hawkesbury – I have no doubt that the river is as alive to her as the characters. Can you let us in on your next writing project? For some years now I’ve not discussed works-in-progress, primarily because I believe that I’ll jinx it, and jinx it in a negative way (as I hinted with Susan Errington). It’s as though the work is unravelled as soon as it’s discussed publicly. It’s not a superstitious thing. All the effort and energy and intelligence one can muster should be focussed on the writing of the work. If I tell someone the story of what I’m working on, then the telling is done and there’s no need to finish the thing. So I’ve always found that it’s best to leave the discussion until the work is properly primed for the world, as in it is published, or very soon about to be. Then I’m happy to talk about it until the cows come home! Having said all that, I’ve always believed that Fall on me and I’m ready now are two novellas in a set of three, each of them explorations of modern Australian family life. So we’ll see what happens with that. You are the founder of the online literary magazine Verity La. What inspired you to start it, and what are your aims for it? One night back in mid-2010 I was watching High fidelity, the fine movie adaptation of the excellent novel by Nick Hornby. In it, the main character owns and runs a record shop but he also has a record-label, which impressed me. I thought, I’d love to make a contribution in a similar way but to writing. I’d been running a personal blog, Under the counter or a flutter in the dovecot, for a year or so, and even though I enjoyed writing for the thing it did seem a little self-focussed. What if I created a blog that other people wrote, and all the writing was fiction or poetry? Realising that it would be difficult to run a literary site by myself, I contacted Melbourne writer Alec Patric, who whole-heartedly embraced the idea. Alec left Verity La at the beginning of 2012, and since then the site’s been considerably redeveloped so it’s now as much a fully-fledged journal as possible. My aims for Verity La haven’t changed – I still want it to be one of the edgiest Australian literary journals. In some ways I’m inspired by Oz from the 1960s, but I’m also inspired by the little photocopied and hand-stapled zines that sometimes you find at markets. I don’t want Verity La to be polite or precious or pretentious; there’s enough of these things in literature already. I continue to want the journal to provide maximum opportunities and exposure for the writers it publishes, but for it also to be light-weight infrastructure – by this I mean that I don’t want it to be administratively burdensome. My main game is being a writer, not an editor, so I have to keep this in perspective otherwise Verity La could end up occupying the majority of each week. Having said that, even though there’s no money in the Verity La universe and everyone involved volunteers their time, I’ve always wanted it to be as professional as possible. Despite the sometimes hand-made aesthetic of the journal, if we are going to publish writing then we’re going to do it to the highest possible standard in terms of editorial practices. At the end of last year, Verity La received a Canberra Critics Circle Award, which recognises all those who’ve contributed to the journal, either as writers, readers, editors, or web-developers, but it’s a sign that we’re doing something worthwhile. As is, it must be said, Whispering Gums. Given the recent demise of Wet Ink, how does the future look for literary magazines? It was very sad to see Wet Ink disappear towards the end of last year – in a relatively short period of time it became one of the most eminent journals in Australia. However, and I apologise if this next comment appears a little callous, I’ve been writing for twenty years now and journals have always come and gone during this time, and this continual evolution is important to a healthy literary community, even though the changes can be difficult to swallow. The online environment provides many opportunities for new and exciting journals – there used to be the problem of design and production and distribution, but the internet, to a certain extent at least, has solutions for these things. Verity La has proven that free blogging software can be used to start up a journal within a matter of hours (though it should be noted that more recently we’ve had professional assistance from the very generous Canberra-based graphic design/web-development firm New Best Friend). Social media together with smart phones and tablet-computers offers extraordinary opportunities – in the past, we had to physically search out a journal, but these days once we’ve subscribed to a site then the literature comes to us and we can read it wherever we are. Poetry in particular will thrive in this environment. That’s not so say that everything’s peachy. It continues to be a challenge to build an audience around literary writing, and I have no idea how an economy can develop in this context where writers can be paid. Will readers pay to subscribe to an online literary journal? If newspapers can’t make it work, then what hope do we have! There are the other challenges of professionalism, standards and quality control. It might be very easy to establish an online journal, but I’m a firm believer in the importance of excellence at all levels of the operation. Here’s a thing. There are approximately 30 tertiary creative writing course in Australia, and enrolment numbers for each are somewhere between a dozen and two hundred. So that’s potentially a couple of thousand creative-writing graduates each year. If only 1% started up a literary journal, then we’d be all better off! So I’m a practical optimist and on the whole am excited about all the opportunities that we have now or will have very soon for writers and readers. Despite all this, it’d be wrong if I misrepresented myself: I do read short works on-line, but I much prefer a hardcopy book, a cup of coffee, and a long afternoon spent on the couch. You are also involved in an arts advocacy group, the Childers Group. Given there are many groups advocating on behalf of the arts, what particular role do you see this group playing? This is an interesting question because whilst there are organisations that have been established to develop various art forms – the ACT Writers Centre, for example – there are very few whose sole mission is to be an advocate for the arts in general. In fact, up until the Childers Group was established in late 2011, there was no arts advocacy body in the ACT region, and there’d been only one or two in the last couple of decades. Nationally, there’s Arts Peak, which is made up of the various art form associations, like the National Association for the Visual Artists as well as Ausdance, but regionally-based advocacy bodies around the nation are very rare indeed. So, for the ACT and surrounding area, the Childers Group certainly fills a gap; it may well be that this model and style of operation is actually a first for the arts in Australia. The Childers Group was originally inspired by the Wentworth Group of Concerned Scientists, which brings cool, calm, considered thinking to environmental conservation matters, so we aim to bring cool, calm, considered thinking to the arts. The arts are too important for there not to be a unified voice based on logic, research and thoughtful conclusions. The ACT is very lucky to have, generally speaking, bipartisan support for the arts and at approximately $15M per year is by far the most important ongoing investor into the creative life of the region. However, step over the border – I’m a Goulburn resident – and things are a bit different, so much so that the NSW Government will no longer be subsidising a range of fine-arts courses. There’s poverty and substantial social and economic hardship in the regions and involvement in the arts provides many people with a way of building their skills and self-esteem. This decision is short-sighted and, for want of a better word, ugly. Going back to Ben Okri and his way of being free, he says two things: ‘Creativity of any valuable kind is one of the fullest expressions of the human and the godlike within us’ and ‘The imagination is one of the highest gifts we have’. And now, for fun. 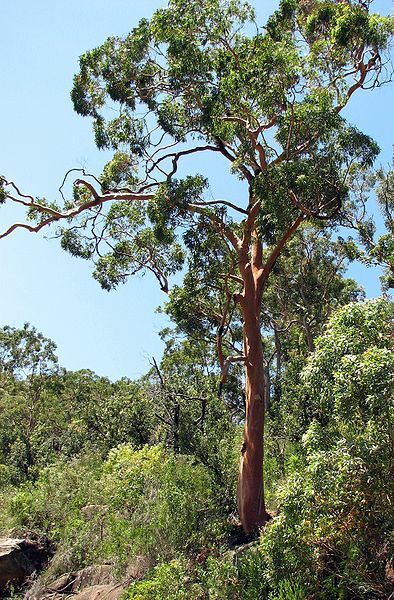 What is your favourite gum tree (because, of course, as an Aussie, you must have one)? Ah, you know I love this and when I first scanned the list of questions I thought, well, that last one is easy – the Angophora costata, that’s my tree. But then I realised that it’s not technically a gum, because it’s not a eucalypt. Except I just can’t change my mind. So, the Angophora costata it is. I grew up on the North Shore of Sydney, right on the edge of the Kuringai Chase National Park. The angophora, or Smooth-barked Apple, loves that hot and dry sandstone country, and we had a very large one in our front yard. They’re magnificent trees with great, smooth, orange-red trunks and twisted, gnarly, sculptural canopies. My mother must have been worried that our tree was getting too big and maybe one day would drop something on me or my two older brothers, so she got around a tree surgeon to take out the odd precarious branch. She must also have been worried about its health in general – being a keen gardener she didn’t want the tree gotten rid of – so, using screwdrivers, we dug little holes in the ground and filled them with a fertiliser called Poplar Special and the tree continued healthily. One year when I was about fifteen or sixteen – I’m not making this up at all – I was mowing the front yard, which was never a task I enjoyed, and still don’t, to the point that I have next to no lawn, when a sugar-glider floated down out of the angophora and landed on the handle-bar of the mower. The animal was so small and delicate and cute, it’s little white-tipped ‘wings’ folded up on each side. I was utterly entranced, enthralled. Not wanting to frighten the thing, I carefully turned off the mower’s engine. The sugar-glider stayed there on the handle-bar, and I thought that maybe he’d come for a cuddle, maybe even some love. So, extra gingerly, I went in to pick him up. My hands got closer and closer. Just as my fingers reached his fur, he turned his head and bit me badly on the finger, drawing blood. He leapt off the mower, and sprinted to the angophora’s trunk and made his way back to the faraway crown. This was such a magical event that maybe, in old age, when I’m about to draw my last breath, it’ll be this story that’ll dart through my mind. Thanks Nigel for these wonderfully thoughtful – though I’d expect no less – responses to my questions. I can see myself coming back to them a few times to digest the ideas you’ve shared with us. I love your favourite gum, by the way. Eucalypt or not, it’s still a gum, and what a pretty one. Finally, thanks again to you and Susan for offering the Wet Ink interview to me. I’m thrilled to have this record on my blog. It’s been great reading this interview series, as the questions (and answers!) are so much more interesting and insightful than the standard questions and sound-bite responses that appear in so many interviews. Thank you, WG and Nigel! Glad you enjoyed them Hannah … Did you see what he said about poetry and literary journals? Wonderful wrap up. I added the Okri book to my TBR list and requested the Relph book from the library. The story about the sugar-glider made me laugh! Oh, that’s great Stefanie. I’ve had Okri on my virtual TBR for a long time. I’d never heard of Relph before but he sounds interesting doesn’t he. Thanks John … Really glad you liked it.